Wrightwood, CA (October 27, 2008) &ndash; Mountain High has launched its 2008/09 website, front loading the season with a brand new look and tech additions such as a deal finder and upgraded video player. 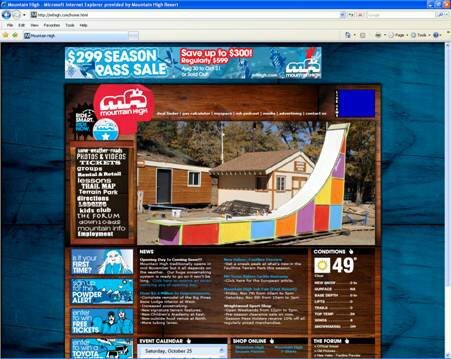 The acclaimed easy navigation and layout of mthigh.com return, along with gas calculator, live webcams, interactive trail map, and up-to-the-minute weather and snow conditions, among other features. With Mountain High&rsquo;s new deal finder, riders can find the best money saving ticket deals based on their ability level, number of days on-snow, and night riding preference. Also new, the site&rsquo;s video player was developed by MobileRider and features Mountain High video content such as the 2008/09 park feature video and a classic season pass spoof. Check out how much cash can be saved by riding at Mountain High versus other Southern California resorts with the gas calculator. The feature works by entering current gas cost, car type, and location, then calculating the round-trip expense to several local areas. Best of all, mthigh.com is updated daily during the season with new photos, weather info, snow conditions, and live webcam images for the best look at current conditions on the mountain. Check out the new site at mthigh.com and keep an eye on the home page for the announcement of Mountain High&rsquo;s opening day. Don&rsquo;t forget, Mountain High&rsquo;s $299 anytime season passes (regularly $599) are on sale until October 31, 2008. Get yours today at mthigh.com.